New Melones Lake is currently holding 527,607 acre-feet of water. The lake level remained stable this past week and it appears more water is being held and less is being released. It is currently at 863 ft. above sea level and 222 ft. from full. The water clarity is clear in most of the lake with a slight stain in some areas. The water temperature is slightly cooling, with the average being 65-71 degrees. The concrete ramp is CLOSED and longer in use. There is also a courtesy dock on the dirt launch which will be in place for the remainder of the summer and until the concrete ramp is open again. 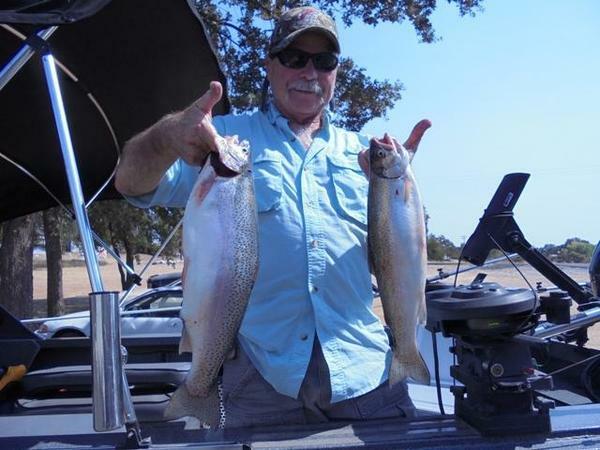 New Melones is kicking out some big 3 to 5-pound holdover rainbow trout. Anglers are not catching a bunch of fish, but the ones they are catching are extremely healthy. The trout are gorging on shad over the deepest portions of the lake where temperature will be cooler. As the surface temperatures drop the lake will start to turn over and the fish will move to shallow water. This will usually happen in the first couple weeks of November. 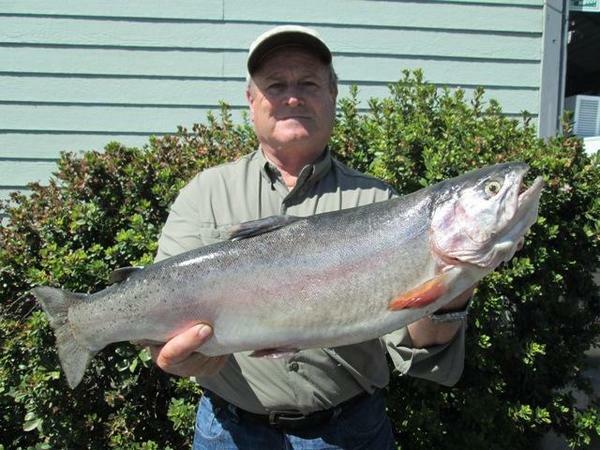 Trolling anglers are dropping down 70' to 90' to catch these large rainbows. Shad patterned lures have been working best. The forecast is calling for some cloudy days this next week. Try trolling brightly painted lures on overcast days and natural colors when the sky is clear. This is also a good time of year to catch big brown trout while rolling shad. The rainbows are large enough to bite a rolling shad rig as well. Bank anglers should be looking to wet a line in the next couple weeks. The trout will start to move shallow as the water temperatures cool. Try soaking some Power Bait, or fan casting a Kastmaster for a chance to catch some of the first fish that move up. We do encourage catch and release for the brown trout as The Department of Fish and Game will no longer be planting them. Carefully measure, weigh and photograph trophy fish and send us pictures and information. The bass bite has been a bit slow and many anglers are struggling to catch fish. There is an abundance of shad and the fish are feeding in short bursts and then resting. Finding actively feeding fish is the key to catching a bunch. The lake is full of healthy 2-pound spotted bass and has some giant largemouth as well. The spotted bass will suspended with the shad and follow them around the lake. Use your electronics to find bait and the bass will be nearby. To cover water and locate schools of feeding fish try using a small swimbait fished on an underspin or a light weight swimbait jig head. This is a great time of the year to throw ripbaits. Small ripbaits will match the size of the shad that they are feeding on. Also try using a lure that can reach deeper water such as a Staysee 90. Be sure to vary your cadence and switch speeds until the fish tell you what they prefer. Soft plastics fish on a dropshot rig or shakeyhead are also good choices. Shad and crawdad patterns will work depending on what type of structure you are fishing. Many fish are suspended over deep water and a light weight will work best and catch fish as it falls. Sometimes shaking the bait through schools of fish will trigger strikes. PLEASE PRACTICE CATCH AND RELEASE. Take photos and carefully release the fish back into to the lake to maintain a healthy fish population for generations to come. Bob Bumbaca and his grandson Blake, caught this 23" catfish trolling in 120' of water at 40' down on a chartreuse Kastmater. 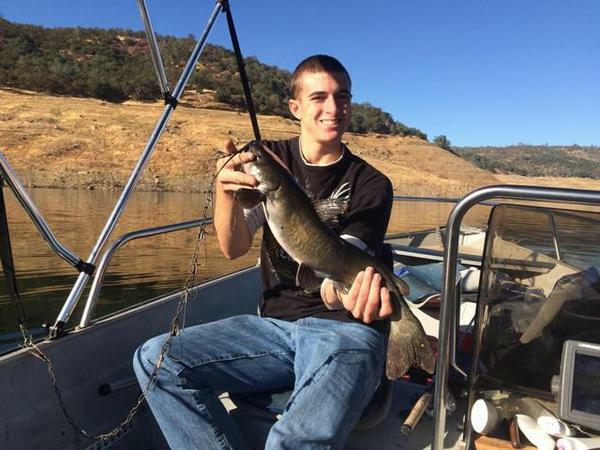 The fish hit about 1/2 way between the spillway and the dam. We are very excited to be bringing back the Glory Hole Sports Fall Catfish Contest which will be going for the entire month of November. Sign-ups start October 1st. Stop by to register and secure a spot. We are seeing some big catfish being caught and we hope to see some giants come to the scales during the month of November. Now is a good time to go out and scout out some of those catfish holes. Many of the biggest catfish will be caught on frozen fish. Shad, mackerel and anchovies are all good choices for bait. Use miracle thread to keep your bait secured to the hook. Catfish have very poor eyesight and will feed by smell. Add some Mike's Lunker Lotion or Power Bait catfish attractant to your bait or use scented catfish bait. Each year many large cats are caught a ball of crawlers. Be sure to grab a box of crawlers before each outing and try using them in combination with other stink baits, catfish dipping worms and dough baits. The crappie bite has slowed and there are very few anglers targeting them. They will be holding in tall standing timber near deep water and feeding on schools of shad that swim past. Live minnows and mini jigs fish under a slip-float will work. Try fishing near the mouth of any of the major creek channels. As the water temperatures cool the crappie will school up and start to feed heavily on the shad that are migrating into creek channels. Follow the bait and the crappie will be nearby.